The area where the Yukon, British Columbia and Alaska meet is home to one of the world’s greatest sledding destinations. Commonly known as the Haines Summit, people travel from all over to enjoy backcountry snowmobiling, skiing and snowboarding through the seemingly endless powder. Below is some basic information on the area. Before heading to the Summit, the K.S.A. highly recommends all back country users follow proper safety guidelines, bring the appropriate supplies and equipment, and visit www.yukonavalanche.ca to get the latest avalanche information. Also please note during popular times such as Easter Weekends B.C. Parks and the R.C.M.P. often visit the Haines Summit area with an eye to public safety. One of the goals of this page is to be a step toward better managing snowmobile use in Tatshenshini-Alsek Park and surrounding areas. The Klondike Snowmobile Association is committed to working with BC Parks and other agencies to ensure that safe and appropriate snowmobile use is a sustainable form of winter recreation in the park. Where can you ride in the park? Snowmobile use is only allowed in a specified area within the park. The specified area is in the park’s Natural Environment Zone, one of two management zones within the park. The other zone in the park is called the Wilderness Recreation Zone. The objective of the Natural Environment Zone is to provide a limited number of entry points along the Haines Highway where snowmobile use is permitted. Generally the use of snowmobiles in Provincial Parks is prohibited. B.C. Parks has generously allowed for this activity to continue in Tatshenshini-Alsek Park providing it is contained within the Natural Environment Zone and does not negatively impact conservation values. However, if this objective cannot be achieved, B.C. Parks will have no choice other than to consider a complete closure to the use of snowmobiles in the park. With this in mind we ask all snowmobilers to please respect the environment and all other back country users, so we can look forward to many more seasons of everyone enjoying the area. Be respectful of others – Snowmobiles can present a danger to other park visitors, especially backcountry skiers and snowboarders. Ride Sober – Avoid alcohol until you are finished riding for the day. Snowmobile operation in this area requires considerable care, caution and attention. Be prepared – Frequently changing and often adverse weather conditions are normal in this area. Be aware – Check snow conditions regularly and learn how to quickly identify high-risk avalanche areas. Be ready – Always carry proper avalanche gear, and know how to use it. Practice regularly with your own equipment so you are comfortable with it and can put it to use quickly and efficiently if needed. Minimize your risk – In hazardous terrain avoid glaciers, traveling underneath cornices, along gullies and in creek beds. Slow it down – Maintain speeds that are responsible and practical for the conditions, especially at night or in flat light. Spread the word – B.C. Parks, the Champagne and Aishihik First Nations and the Klondike Snowmobile Association urge you to make your fellow snowmobile enthusiasts aware of responsible and appropriate use in the park. 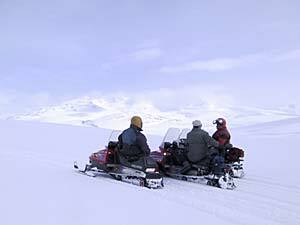 The use of snowmobiles in Tatshenshini-Alsek Park has increased significantly over the last several years. During this time B.C. Parks and the Champagne and Aishihik First Nations have taken steps to provide winter recreation opportunities for those wishing to ride snowmobiles in this magnificent corner of British Columbia. At the same time, B.C. Parks is committed to protecting the natural environment and preserving wildlife species and their habitat. Recent studies indicate that snowmobile activity does affect a wide variety of animals, often resulting in behavior alterations, habitat avoidance, and energy expenditures at critical times when animals are under extreme stress due to winter hardships. By respecting wildlife you encounter while riding in the park, you will help preserve the long-standing value this area provides for wildlife and their habitat.